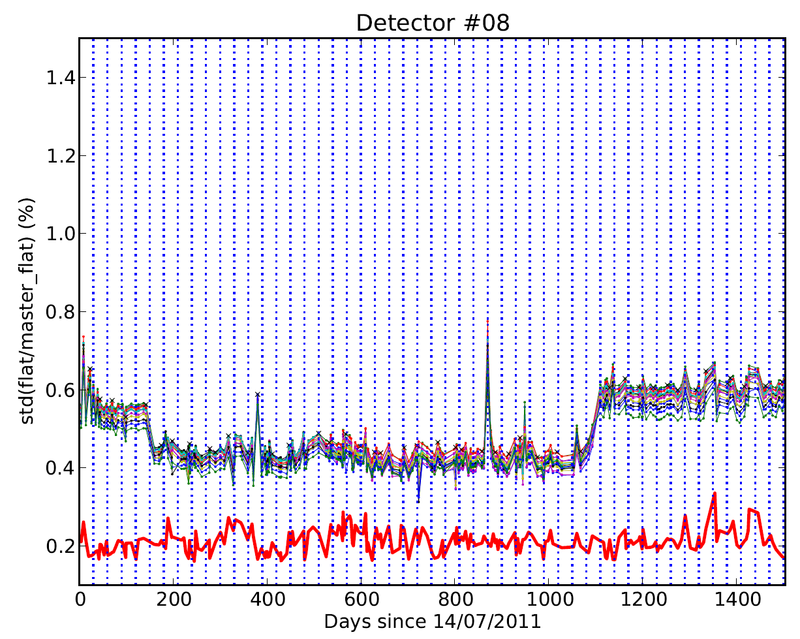 Summary of the behaviour of flats along the VISTA timeline and across the detector units. With time, it is expected that the behaviour of the VISTA system with evolve, leading, among other things, to changes in the flats. The current reduction strategy generates a set of master flats on a monthly basis. These twilight flats are always checked by hand prior to their incorporation into the reduction pipeline. This guarantees the freshness of the calibrations, while ensuring that there are enough raw flat frames to produce a high quality master flat for each of the filters. We also monitor the overall evolution of the flats during the VIRCAM lifetime. 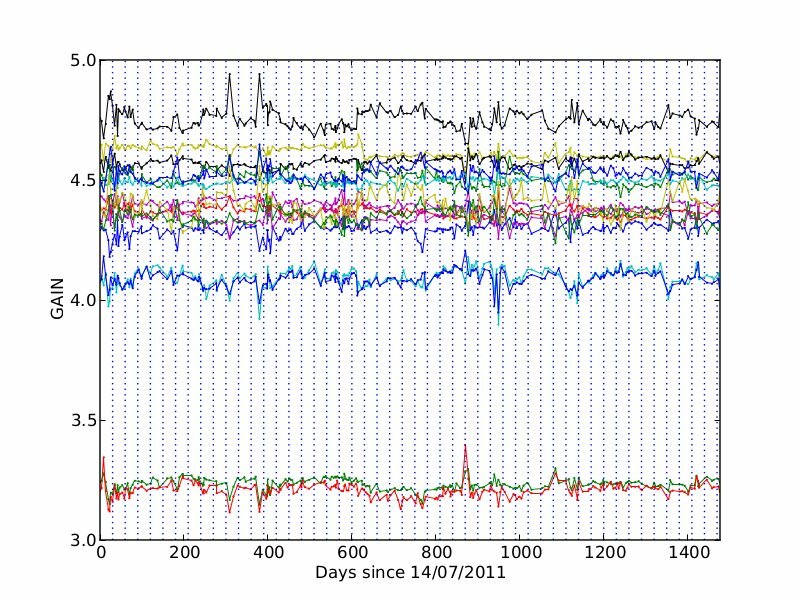 We compare each flat with a median flat frame obtained combining a random sample of flats spread over the whole temporal baseline. The idea is to examine the evolution of the 2D structure of the flats through the spatial std of the ratio of each nightly flat with respect to this median flat. The requirement is that flats are stable within a 1%, and this is true for almost all channels in all detectors, as can be seen in the next figure and the attached file. Each line represents one of the channels of chip #8, while the thick red line is the std expected from pure photon noise. The flats marked with crosses are the one selected as monthly master flats. Keeping track of flat frames also allows us to monitor the overall behaviour of the gain. On top of the nominal gain for each detector, flats are used to compute a correction factor (encoded as GAINCOR in the headers) that ensures an uniform response all across the instrument array.